Yesterday, on the Solemenity of Saints Peter and Paul, Pope Benedict XVI bestowed the pallium upon the recently appointed Metropolitan Archbishops. The pallium is a circular band of wool worn around the shoulders and above the chasuble of a Metropolitan within his Province. At his inaugural Mass, the Holy Father reflected upon the symbolism of the pallium, the relevant text of which I will post later today. 1. Cardinal Jorge Liberato UROSA SAVINO, archbishop of Caracas, Venezuela. 2. Cardinal Crescenzio SEPE, archbishop of Naples, Italy. 3. Archbishop Louis CHAMNIERN SANTISUKNIRAN of Thare and Nonseng, Thailand. 4. Archbishop Jose Belisario DA SILVA, O.F.M., of Sao Luis do Maranhao, Brazil. 5. Archbishop Jabulani NXUMALO, O.M.I., of Bloemfontein, South Africa. 6. Archbishop Jorge Enrique JIMENEZ CARVAJAL, C.I.M., of Cartagena, Colombia. 7. Archbishop Tommaso VALENTINETTI of Pescara-Penne, Italy. 8. Archbishop Fabriciano SIGAMPA of Resistencia, Argentina. 9. Archbishop Odon Marie Arsene RAZANAKOLONA of Antananarivo, Madagascar. 10. 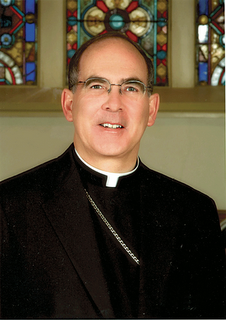 Archbishop George Hugh NIEDERAUER of San Francisco, United States. 11. Archbishop Jose Luis MOLLAGHAN of Rosario, Argentina. 12. Archbishop Cornelius Fontem ESUA of Bamenda, Cameroon. 13. Archbishop Daniel N. DiNARDO of Galveston-Houston, United States. 14. Archbishop Antonio Javellana LEDESMA, S.J., of Cagayan de Oro, Philippines. 15. Archbishop Jose Serofia PALMA of Palo, Philippines. 16. Archbishop Sylvain LAVOIE, O.M.I., of Keewatin-Le Pas, Canada. 17. Archbishop Joviano DE LIMA JUNIOR, S.S.S., of Ribeirao Preto, Brazil. 18. Archbishop Luigi CONTI of Fermo, Italy. 19. Archbishop Franc KRAMBERGER of Maribor Slovenia. 20. Archbishop Ignazio SANNA of Oristano, Italy. 21. Archbishop Francois-Xavier MAROY RUSENGO of Bukavu, Democratic Republic of the Congo). 22. Archbishop Jean-Pierre KUTWA of Abidjan, Ivory Coast. 23. Archbishop Andrea MUGIONE of Benevento, Italy. 24. Archbishop Orlando BRANDES of Londrina, Brazil. 25. Archbishop Georges PONTIER of Marseille, France. 26. Archbishop Donald William WUERL of Washington, United States. 27. Archbishop Wojciech ZIEMBA of Warmia, Poland. Tomorrow, the Solemnity of Saints Peter and Paul, Pope Benedict XVI will celebrate the fifty-fith anniversary of his ordination to the Priesthood of Jesus Christ. This morning I finished reading his, Milestones: Memoires, 1927-1977, which he wrote while still Joseph Cardinal Ratzinger. We were more than forty candidates , who, at the solemn call on that radiant summer day, which I remember as the high point of my life, responded, "Adsum", here I am. We should not be superstitious; but at the moment when the elderly archbishop laid his hands on me, a little bird - perhaps a lark - flew up from the high altar in the cathedral and trilled a little joyful song. And I could not but see in this a reassurance from on high, as if I heard the words, "This is good, you are on the right way" (99). That little bird, I expect, sang with joy for the ordination of the future Pope! The bear that took the place of Saint Corbinian's horse, or rather donky - the bear that became his donkey against its will: Is this not an image of what I should do and of what I am? "A beast of burden have I become for you, and this is just the way for me to remain wholly yours and always abide with you." 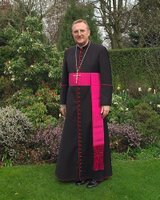 What else could I say in detail about my years as a bishop? It is said of Corbinian that, once in Rome, he again released the bear to its freedom. The legend is not concerned about whether it went up into the Abruzzi or returned to the Alps. In the meantime I have carried my load to Rome and have now been wandering the streets of the Eternal City for a long time. I do not know when I will be released, but one thing I do know: that the exclamation applies to me too: "I have become your donkey, and in just this way I am with you" (155-156). How beautiful and moving is the heart of this humble and prayerful man! On the day of his election as the Supreme Pontiff he referred to himself as "a simple and humble labourer in the vineyard of the Lord." How true this is! Thank you, Holy Father, for continuing to make yourself the donkey of the Lord, and in this way the donkey of the universal Church! Ad multos annos, gloriosque annos, vivas, vivas, vivas! Pope Benedict XVI today reflected on the person of the Apostle James the Less and, although seemed at first slow, he presented us a gem at the end as usual. "The most prominent action [James] accomplished," said the Holy Father, "was his intervention on the question of the difficult relationship between Christians and Jewish origin and those of pagan origin" at the Council of Jerusalem. Implicitly noting the humility of the Apostle, Pope Benedict commented that "To him in fact is attributed the Letter that bears his name James and is included in the New Testament canon. He does not present himself as the 'Lord's brother,' but as 'servant of God and of the Lord Jesus Christ' (James 1:1)." There's something to think about the next time we try to throw around the weight of our position and friendships. And, of course, as he has done with Peter, Andrew, James, and John, so the Holy Father does with James the Less. What lesson can we learn from the example of his life? Says the Bishop of Rome, "Thus he teaches us not to presume to plan our lives in an autonomous and selfish way, but to make room for the inscrutable will of God, who knows the true good for us. In this way, St. James is always a timely teacher of life for each of us." The Most Reverend J. Peter Sartain, 54, was installed yesterday afternoon as the fourth Bishop of the Diocese of Joliet, succeeding the Most Reverend Joseph L. Imesch who was the Bishop of Joliet for nearly twenty-seven years. Archbishop Pietro Sambi, the Apostolic Nuncio to the United States of America, announced BXVI's decision to appoint Bishop Sartain to the Church of Joliet on 16 May 2006, a transfer that seems then rather swift. The former Bishop of Little Rock has indicated his desire to make vocations a central focus of his episcopal ministry, saying, "You'll hear me very often casting the net." If every bishop would follow his example, just think of the great harvest of vocations Holy Mother Church would reap! Bishop Sartain was ordained in 1978 and holds a Licentiate from San Anselmo in Rome. As he has now taken his chair, let us pray for Bishop Sartain and the Diocese of Joliet, a Diocese through which I travel often. What wonderful news! I have tried unsuccessfully for several months to upload a profile picture. For whatever reason I always received a host of error messages but, I am quite happy to say, tonight I have finally had success! Enjoy! They say, whoever "they" may be, that you learn something new every day. Today is no exception for me. As I read today BXVI's Angelus address which he gave yesterday, I was quite surprised to learn that "the solemnity of the Sacred Heart of Jesus is also the World Day of Prayer for the Sanctificaiton of Priests." I had no idea. For all of you who were aware of this day and prayed for us priests, I offer my humble gratitude. Says Jesus today, "Quiet! Be still!" (Mark 4:39). These two commands of his may at first seem odd, and even perhaps out of character, but if we take a closer look into these two commands we will come to learn something deeper and more profound about what it means to be a disciple of the Lord Jesus Christ. He gives these two commands in the midst of a turbulent storm as the disciples feared for their lives because of its seeming strength. To these disciples, we can attribute the words of the Psalmist today, "His command raised up a storm wind, which tossed his waves on high. The mountain up to heaven; they sank to the depths; their hearts melted away in their plight" (Psalm 107:25-26). As the waters of the sea threatened to overcome the disciples, they seem to have forgotten him in whose company they were; they failed to recognize the one who himself has power over the very seas and the wind because he has created all things. In their anxiety and in their worry, they did not recognize the calm and quiet power of Christ, who slept in their very midst. In this you rejoice, although now for a little while you may have to suffer through various trials, so that the genuineness of your faith, more precious than gold that is perishable even though tested by fire, may prove to be for praise, glory, and honor at the revelation of Jesus Christ (I Peter 1:6-7). But why do these trials and storms come upon us? The Prince of the Apostles tells us this: "For to this you have been called, because Christ also suffered for you, leaving an example that you should follow in his footsteps" (I Peter 2:21). Even today, the Successor of Peter, Pope Benedict XVI, encourages us, saying, "The Lord does not close his eyes to the needs of his children, and if he seems at times insensitive to their requests, it is only in order to test them and to temper their faith" (Angelus Address, 14 August 2005), and "The Lord’s ways are not easy, but we are not made for ease" (Address to his Countrymen, 25 April 2005). At times it seems to us as though the Lord has left us; it seems as though the Lord is asleep and completely deaf to our cries, and so - with the disciples - we go to him, we rouse him from his slumber, we bring our storm into his calm - and we cry out to him, "Teacher, do you not care that we are perishing?" (Mark 4:38). We can be sure that just as Jesus answered the disciples so he answers us as well: "Quiet! Be still!" Some might say to me, "Father, Jesus said these words to the wind and the waters, not to the disciples," and in saying so they would be correct; but at the same time we hear the Psalm and thus learn that the disciples "rejoiced that they were calmed, and he brought them to their desired haven"(Psalm 107:30). Here then, we see that Jesus says, "Quiet! Be still!" to both the sea and the disciples. Who shut within doors the sea, when it burst forth from the womb; when I made the clouds its garment and thick darkness its swaddling bands? When I set limits for it and fastened the bar of its door, and said: Thus far shall you come, but no farther, and here shall your proud waves be stilled! (Job 38:8-11). Within this response of the Lord to Job we might well hear the Lord saying to him as well, "Quiet! Be still!" This is not to say that we cannot ask these questions of the Lord when we find ourselves in difficult times and circumstances which we cannot begin to fathom. We want to know why and we certainly can ask these questions of the Lord - and in some instances it is only proper that we do so - but at the same time we must always realize who we our and who God is. We must realize that he alone has power over the tempests of life. At the same time the more that we yell at him, the more that we question him, the less likely we are to hear him speaking to us in the depths of our heart. It has been said that God speaks in silence. God does not speak through loud noises but through quiet and through solitude. Jesus commands us to be quiet so that we can hear him calling within us in the "tiny whispering sound" through which the Prophet Elijah heard him speak (I Kings 20:12). God is a chatterbox. I say that only slightly tongue-in-cheek, because God never stops talking to us. The reason we suffer, the reason we feel fear, the reason we feel disjointed and unfocused and lost is because we don’t realize that at any given moment the answer to all our questions, the balm for all our suffering is right in front of us. We just don’t realize it. Why? Because most of the time we don’t shut up (p. 13). How true this is! We spend our day surrounded by constant noise: the conversation of family and friends, the television at home, the radio in the car or at work, the musak in stores, the rumble of trucks and motorcycles on the street, our cell phones and Ipods, the songs we hum in our head. We are, to be quite honest and frank, afraid of silence. At first we feel utterly alone in silence and we are uncomfortable. When this feeling of abandonment comes upon we must remember that as the Holy Father said at his Inaugural Mass, "Those who believe are never alone – neither in life nor in death" (Inaugural Homily, 24 April 2006). The Lord Jesus is always with us, even and especially in the midst of the storm. As the storms of life engulf us we very often try to cling to things, to people, to memories, to work, to hopes, dreams, and plans, and yet the more we grasp the more pain we feel. When the storms of life sweep over us, we must cling only to Jesus Christ for in him alone "new things have come" (II Corinthians 5:17). We must cling only to him who is Love itself, for "everything in this world will pass away. In eternity only Love will remain" (Pope Benedict XVI, Homily, 25 March 2006). In his customary gentleness and kindness, BXVI today at his General Audience, "As it is very hot today, I would like to abbreviate and mention only two of these occasions [where James the Greater appears in Scripture] now." The Apostle, he said, "is presented to us as an eloquent example of generous adherence to Christ." In one case, James, with the other two disciples [Peter and John], experiences the Lord's glory, sees him speaking with Moses and Elijah, sees the divine splendor revealed in Jesus; in the other, he finds himself before suffering and humiliation; he sees with his own eyes how the Son of God humbles himself, become obedient unto death. As the son of Zebedee followed after Christ Jesus "he had to discern how the Messeiah . . . was in reality not only surrounded by honor and glory, but also by sufferings and weakness. The glory of Christ was realized precisely on the cross, in taking part in our sufferings." promptness in accepting the Lord's call, even when he asks us to leave the "barque" [an ancient boat] of our human securities; enthusiasm in following Him on the parths that he indicates to us beyond our illusory presumption; readiness to give witness to Him with courage and, if necessary, with the supreme sacrifice of life. But not only this, in examining the life of James we can see that he underwent a conversion of a truly profound sort. It was, of course, james "who initially requsted, through his mother, to be seated with his brother next to the Master in his Kingdom" and it was James who "was precisely the first to drink the chalice of the passion, in sharing martyrdom with the Apostles." I expect that the Holy Father will continue these on the Apostle James next week. Keep them coming, Holy Father! 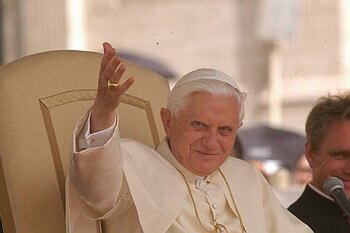 BXVI's homily for Corpus Christi is finally available in an English translation. His homily is one continuously flowing meditation upon the bread which is used for the Eucharist. I highly recommend it. This morning I was browsing around the expansive territory of that place that is no place, the world wide web. As I did so I stumbled upon something that caught me quite by surprise: a web site of one of the students who attends the high school at which I teach. "prolly the coolest guy ever is Father Darin (i think some of you will agree with me on this)". Which, translated into proper English grammar and spelling, means, "Probably the coolest guy ever is Father Daren (I think some of you will agree with me on this)". I find myself quite perplexed and humbled by his comment because, to the best of my memory (which, is, admittedly, failing more every day) I have only had a couple of very brief encounters with this young man. And, the only one individually that I recall was when he happened to see me in the mall. He kindly greeted me by title and name and I greeted him back and we both went about our business. What is more, he is not a Catholic, although he is a Christian and a sincere believer from what I can see. I do not know why a young man in high school would consider me the "coolest guy ever." I could, I suppose, try to find out the reasons why he makes this bold and false claim (clearly I am not any cooler than, say, St. Francis of Assisi or King Arthur), but instead I shall simply humbly accept it with gratitude to the Lord God who continues to work wonders in and through his people. May the Lord bless this young man who does not even know that I have been to his web site. It was announced last evening prior to the celebration of Vespers that the Reverend Father Joel M. Hastings, priest of the Diocese of Duluth, will continue in his position as the Enforcer of Choral Discipline for the Liturgical Institute at the University of St. Mary of the Lake. Fr. 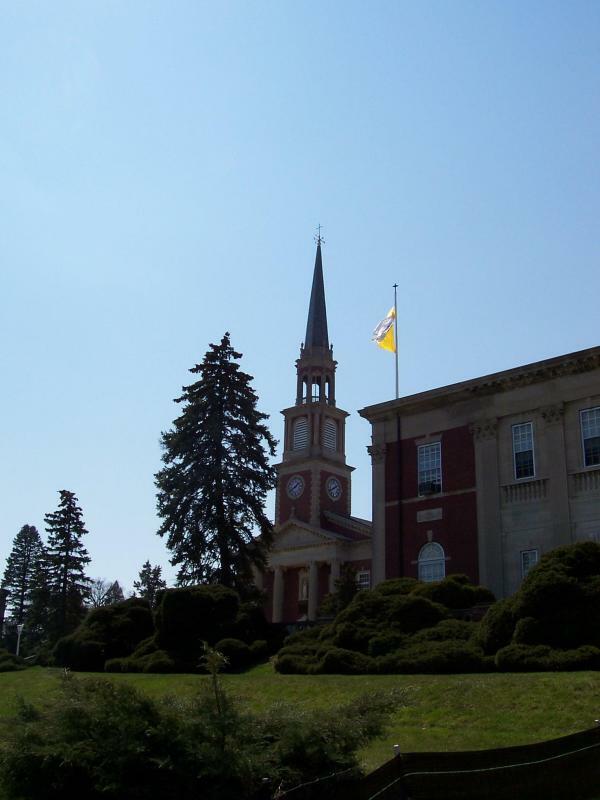 Samuel Weber reappointed Fr. Hastings to the post since "he did so well" last year. In typical fasion, Fr. Hastings said this was only possible because "there was not much to do." The ECD is responsible for correcting any singers at Lauds, Holy Mass, or Vespers who do not sing with the rest of the assembly, thereby causing distractions from sacred worship. The Reverend Father Samuel Weber, O.S.B. 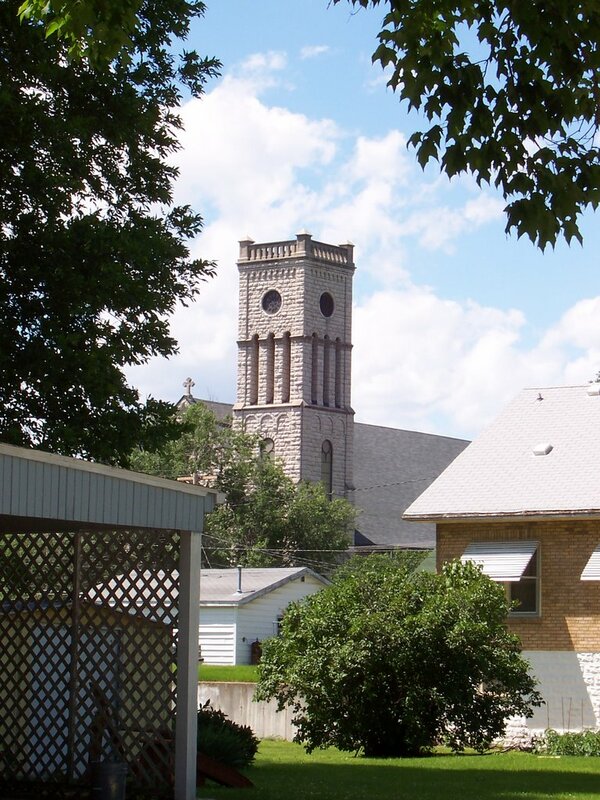 is expected to announce today the appointment of the Enforcer of Choral Discipline at the Liturgical Institute of the University of St. Mary of the Lake in Mundelein, Illinois. A secret council will be convened today at which the selection of the Enforcer will be determined. So secret is this committee that, says the Benedictine monk, "they do not even know who they are; it could be you." More information as the development continues. I recognize that Father's Day is, for a great many Americans, a day to relax in the company of their father. It is a day, and a most fitting day, to honor the fathers who care for their family and raise their children well. It is a reflective day and a joyful one. For twenty years now, the first has been true for me, but the second day not so much. When I stop to realize it, it seems simply impossible: my father has been dead now these past twenty years. They have been good years, but they have also been difficult. Not a day goes by that I do not think of my parents (mom has been dead now these past eighteen years). While I fully know that my parents continue to care for me and protect me and pray for me - and for all this I am eternal in their debt - the pain of their loss still is great and, of course, some days it is worse than others. Father's Day happens to be one of those days. I kissed the earth on my daddy's grave / said goodbye to brave young companions / but when they hoist that sail I know my heart will break / as bright and as fine as the morning / I don't know where this road will take me / but they say there's a place there for a man / and I'm only afraid that my dreams may betray me / and I'll never get home again. Today I make these words my own. It is because of the honesty of his music that I have greatly admired and loved Rich Mullins' music since I was first introduced to it on my first Teens Encounter Christ weekend (special thanks here are due to David, who has since become a spiritual father to me [thanks to Sharon, too]). My Aunt Mary and Uncle Bob, who raised my brother and I and after dad died, raised me well. I grateful for their love, encouragement, and support. There is one thing that my uncle said to me on several occassions. He has been a factory worker most of his life and in this way has provided well for his family. It is difficult work, and yet he always goes. When I younger, probably twelve or thirteen or so, I remember saying to him that I wanted to work where he worked because the money was good. He said to me, on three occassions that I can remember, something to the extend of, "You're too smart for that." He may even have said it this way, I cannot recall properly at the moment; I wrote them down but I do not have that notebook with me. He never said this to disparage himself or anyone else, but only to encourage me and to foster the natural ability for learning that he saw in me. I know that it is because of his words that I am now pursuing my fourth degree and have always valued academic work above "manual" labor. For this, too, I am grateful. At any rate, in my heart I have kissed my father's grave, and my mother's, as well. I have a vision as to what will happen to me once I have died and, according to the grace and mercy of God, I come to enter into his heavenly kingdom. I cannot help but see me entering into Paradise and being greeted and welcomed by my exhuberant parents. We will very quickly - and very briefly - embace lovingly, but they will then hurriedly grab my hands and together we will run and they will bring me before the Lord himself. And that will be our reunion; after this we will adore the Lord together and share in the Beatific Vision. I am grateful for this vision because it brings with it great comfort and love. Tomorrow I will have the tremendous opportunity to adore the Lord Jesus with my parents on the Solemnity of Corpus Christi. We know that in every Liturgy we join in the worship of the angels and the saints; we join in the worship of heaven itself. As such, the angels and the saints are present to us at every Mass. This a reality of the faith that I think we pay too little attention. Tomorrow, as I mourn the loss of my father I will at the same time be united with him in prayer. How beautiful are the ways of the Lord! Pray for your father tomorrow, whether living or dead. Pray also for the outpouring of the Holy Spirit upon all fathers, that they may learn again the great importance and seriousness of their role as the head of the family and the first teacher in the ways of faith. Mom and Dad, pray for me! Today I drove from Mundelein, Illinois to Shrewsbury, Missouri, and then to Effingham, Illinois, and from there, back to Mundelein. Thankfully, today was a splendidly beautiful day for such a drive so it was rather enjoyable. As I drove listening to great music of various styles, I rolled down the windows and opened the moonroof and very much enjoyed myself. But as I continued driving the interstates in Illinois, I was struck at the many convertible cars on the highway whose drivers kept the rooves of the cars up and in place. Why is it that someone would spend the extra money for a convertible and then not take advantage of it when the weather was as gorgeous as it was today? Just something to ponder. This one-word order is one that few generals ever hope to issue because it seems to signal defeat, but it is one that the Most Reverend George J. Lucas issued to his people this past week. However, "given the hectic pace of most of our lives, it is more important than ever that we plan some quiet time to rest in the Lord." For the follower of the Lord Christ, retreating is not a sign of defeat, but rather one of coming strength and victory. Citing the example of Jesus, the Bishop of Springfield in Illinois reminded the faithful that "the practice of taking a little time away from ordinary responsibilities has a rich tradition in our Catholic faith." It is precisely "because each baptized person is called to holiness" that retreats are a fitting spiritual exercise for clergy, consecrated men and women, and laity alike. Indeed, His Excellecy stated that "lay persons, too, have found great benefit in making a retreat." He issued his order to "retreat" in the form of an invitation, asking his people, "While you are considering this possibility, you can whet your appetite for more time with the Lord. Turn off the radio in the car and pray the rosary or listen to inspirational talks or music. Begin regular visitis to the Lord in the Blessed Sacrament." I can hardly believe it. The word on the street is that both the adaptations to the Roman Missal and the translation of the Order of Mass have been approved by the United States' bishops, with little more than five minutes of debate time. I must admit that while I am ecstatic at this blessed news, I am a bit disappointed, as well. I had been hoping for a bit more of a show. For more information, check out Rocco Palmo's blog. I have no idea where he gets his information but he is usually quite well informed and insightful. 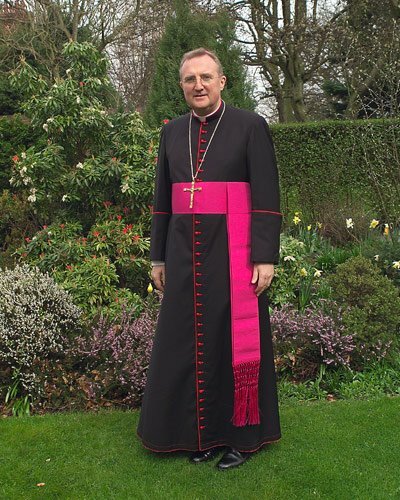 In his address today to the United States Conference of Catholic Bishops, the Most Reverend Arthur Roche, Bishop of Leeds (England), said to the U.S. bishops, "What a shame it would be if the most important tool we have for formation and worship [translations] was reduced to politics, as if the highest or only form of discourse we can manage in the Church (or society) is political discourse." In reference to the many complaints that have been circulating concerning the proposed translation of the Order of Mass, a translation that is faithful to the principles set forth by the Holy See, Bishop Roche reminded the bishops that "you yourselves approved our statutes when ICEL [the Internation Commission on English in the Liturgy] was reconsituted four years ago." While Bishop Roche, the current Chairman of ICEL, admitted that the English employed in the United States, Great Britain, and other countries has varrying differences - even within a single country - he affirmed "alongside the regional variations there is an American Standard English by means of which people from all over the country communicate with each other." The principle behind this uniform language "can be applied internationally," the Bishop noted. Following these introductory remarks, Bishop Roche proceeded to comment on several particular instances of the proposed translation which have elicted perhaps the greatest controversies. The translation of the Fourth Eucharistic Prayer which we currently use reads, "...he took the cup filled with wine..." while the proposed translation reads "...he took the cup filled with the fruit of the vine." Some have objected to this, saying that the fruit of the vine is wine; it is, they argue, too wordy. In response, Bishop Roche pointed out, "we hear the words 'the fruit of the wine' on the lips of the Lord himself in all three synoptic Gospels - which I would consider as being more than enough reason to respect their form." Taking such issues to the next level, the Chairman remarked that "the more I go through this process the clearer it is to me that very many of us need to revisit the theological reasoning behind the various parts and components of the Mass, as well as considering the theological sources from which the texts of the Mass have been culled. In the main, these are the Sacred Scriptures and the Fathers of the Church." "The link between the Liturgy and Scripture," he reminded the Conference, "on which Liturgiam authenticam lays emphasis, seems so obvious, important and valuable. I find it quite interesting to note the issues that can arise in this regard. Continuing in this vein, Bishop Roche pointed out "that scriptural catechesis is central to liturgical catechesis. It was said of St. Bernard that he knew the Sacred Scriptures so well that his language was biblical - he began to, as our young people would say today, 'speak bible.' My point is that in using a translation that is more faithful to Sacred Scripture we are teaching ourselves and our people to speak bible! Concluding his remarks, the Chairman reflected that there are "so many people with so many ideas, but in the end it is we bishops, in union with our Holy Father, who have the responsibility of faithfully handing on to them [the faithful] what we have received from the Lord." He further noted, "We are at a very important moment in the whole of this process. If the bishops of the English-speaking countries can agree on a single version of the Mass, what a sign of catholicity that will be. But more than that, it will be a guarantee of catholicity for the future, not only in our own time, and not only in our own countries. Clearly I, and all my brother bishops of ICEL, believe that you, the bishops of the United States, have a most important role of leadership to play in just that." Well said, your Excellency! Thank you!!! Let the words be flung! The United States Conference of Catholic Bishops continues to meet for their annual June meeting, this year in Los Angeles, California. The June meeting - unlike the November meeting - is typically geared more toward a retreat-type atomsopher, with the weightier topics before the Conference reserved for the November meeting. This year, however, this seems not to be the case. The key topic in this meeting of the Bishops is, of course, the vote concerning the adaptations of the Liturgy and the English translations now before them. The Episcopal Conferences of England, Wales, Australia, and Scotland have - as I understand it - all apporoved the translations which the Bishops of the United States will vote on this week. In order to approve the current translations the Bishops need a two-thirds majority vote; the last poll of the Bishops indicated that they were fairly evenly split. In fact, the issue of translation has been a dividing issue among many Bishops for several years now. There appear to be two main "camps": those who prefer a close, literal translation of the Latin text (which is the position of the Holy See), and those who prefer simply not to change the text because Catholic Americans do not want to change and would not understand such technical language as "Incarnate." I wish EWTN was broadcasting this meeting because it would be a great show. If the Bishops do not approve the proposed translation, it is unclear what action the Holy See will take; it has - through the words of Francis Cardinal Arinze, Prefect of the Congregation for Divine Worship and the Discipline of the Sacraments - expressed a desire that the Bishops approve the translation. Pray for our Bishops, that they remain open to the promptings of the Holy Spirit and the authentic needs of the People of God. The Apostle Andrew "was a man who was searching, who shared Israel's hope, who wanted to know better the word of the Lord, the presence of the Lord," remarked Pope Benedict XVI in his general audience today. A great multitude of people today is searching for the answers to the meaning and purpose of life; they search, too, for fulfillment, peace, and happiness, but never do they truly look to Jesus. May the holy Apostle intercede for them and - even as he did for his brother, Simon Peter - show them Christ Jesus, the only satisfaction to their deepest yearnings and desires. As "the first apostle who received the call and followed Jesus" there is much that we can learn by examining the passages in the Sacred Scriptures within which we encounter this fisherman from Galilee. On the one hand, says the Holy Father, "It is worthwhile to underline Andrew's realism," while on the other "we may deduce that we do not have to be afraid to ask Jesus questions, but at the same time, we must be ready to accept the teachings, also astonishing and difficult, which he offers us." Why are we so very hesitant to ask Jesus the difficult and pressing questions of our lives? He has told us time and time again that we need not be afraid to come to him in humility and trust. We can - and should - ask him the questions which rise in our hearts about our purpose, our fulfillment, our happiness because he alone is the answer. Could it be that we know what answer Jesus will give us once we ask him our questions? Do we not, at least at some level, already know that he will say to us, "If anyone wishes to come after me, he must deny himself and take up his cross daily and follow me" (Luke 9:23)? I think we do, and here we can look to the example of St. Andrew, the blessed mar tyr. In examining the martyrdom of St. Andrew, the His Holiness exhorted everyone: "We must learn a very important lesson: Our crosses have value if they are considered and welcomed as a part of the cross of Christ, if they are touched by the reflection of his light. 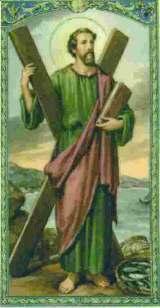 Only through that cross our sufferings are also ennobled and attain their true meaning. " Thank you, Holy Father, for these reflections; we eagerly await next week's reflections! 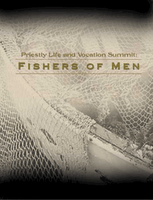 If you have not seen the Fishers of Men, put out by the United States Conference of Catholic Bishops, you really should. You can watch a clip of the video here; it is quite good and is a fine start toward a renewed promotement and encouragement of vocations to the priesthood. For too many years have we simply sat by and expected vocations to rise up on their own from our parishes and families. I am absolutely convinced that vocations are abounding in the Church today, we know that the Lord has not stopped calling young men to serve him as priests, but that instead young men are not hearing his call, in no small part because we are doing very little to help them hear his call. We must do all that we can to help young men answer the call of the Lord, we must explicitly encourage vocations by asking those whom the Lord might be calling to seriously and prayerfully consider a life lived in service to the Lord and to the Church. Let us dedicate ourselves anew to the promotion of vocations, for, in the words of St. Francis of Assisi as he neared his death, "Let us begin, for until now we have done nothing." All you holy Apostles, pray for us! Yesterday a priest-friend and I ventured down into the basement of the Feehan Memorial Library of Mundelein Seminary to the famed shelves marked "Book Sale" with the hope of scavenging uncovered hidden treasures. On these shelves one can find anything from The Documents of the Second Vatican Council to such oddities as The Art of Tofu. It is often quite an eclectic collection. I always get a chuckle when presenting such an assortment of books to a librarian or to a cashier at a bookstore; they are simply never quite sure how to take a seemingly odd collection of books at one time from one person. You should try it sometime. The Most Reverend George J. Lucas, Bishop of the Diocese of Springfield in Illinois, reminded the faithful that in baptism, "We are called to be holy and mediate the saving plan of God in the time and place in which we live." He went on to reflect that the primary way in which we attain holiness and mediate the plan of God is by faithful attendance and participation at Sunday Mass. "The greatest privilege and the most important responsibility given to God's priestly people is the full participation in the church's liturgy, especially the Mass," he said. "Of course the ordained priest plays a central and unique role, as he stands in the place of Christ at the head of the church. But the Lord desires that all the members of his Body be there, too." It is "At the eucharistic sacrifice, the baptized bring their lives and offer them to God, in union with the perfect offering of the Lord, for their salvation, and also for the salvation of the world," the Bishop reflected. At the same time, there are additional means to growth in holiness. "In good works, too, the baptized exercise their priestly function." Indeed, "The baptized, made holy by sanctifying grace, participate in the priestly work of Jesus by living as holy spouses, holy parents, holy children. They are not shy about being holy in public. They are reminders of God's plan for the sanctification of all the world in businesses and on the farm, in classrooms, in hospitals, in labor unions and in government." Bishop Lucas concluded his remarks on the universal call to holiness with a call to the basics: "The essentials remain: the Eucharistic liturgy and the privilege, at work or at leisure, of sanctifying the world in union with our Lord Jesus Christ." It Won't Be Long - I Hope! It has been reported that the General Secretariat of the Synod of Bishops will soon present to the Holy Father an outline from the Synod discussions which Pope Benedict will use to write his post-synodal apostolic exhortation on "The Eucharist: The Source and Summit of the Life and Mission of the Church." The Holy Father has already expressed his desire to write this exhortation. 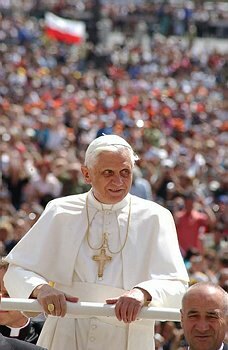 Let us invoke the guidance of the Holy Spirit as Pope Benedict writes this important message. Let us pray, also, that he does not take too long writing it. 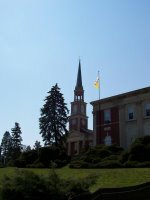 Today marked the first day of classes for the Summer 2006 session of the Liturgical Institute at the University of Saint Mary of the Lake. It feels very good to be back on campus, to the place I lived and studied in for five years. I have memories of seminary life here, some unhappy, but most quite joyous and good. I began the day with an early morning swim since I woke up at 5:00. When I was seminarian I began every day and ended every day with a swim. I feels great to be able to this again. If you can, I highly recommend it! Thus far, I have been in two of my three class: History of Christian Thought IV and Marriage and Orders, taught by Fr. Robert Barron and Fr. C. Eugene Morris, respectively. Both are excellent instructors and I beleive both classes will be quite interesting and exciting. I must be off shortly for Latin I; I hope all is well! History of Christian Thought IV: This course is an exploration of the Christian theology that emerged in the West during the revolutionary sixteenth century. Because of the protest raised by Martin luter and his fellow reformers, Christians on both sides of hte Protestant-Catholic divide were compelled to wrestle with basic questions in the areas of theological anthropology, Christology, sacramental theology, and ecclesiology. We shall follow some of these debates by studying key texts of Martin Luter and John Calvin, as well as the official Catholic response to the Reformation as detailed in the decretals of the Council of Trent. Our study will close with an examination of the densely complex arguments concerning the relationship between divine grace and human freedom that preoccupied Catholic theologians at the close of the sixteenth century. Marriage and Orders: The sacraments of Matrimony and Holy Orders are examined. The course will provide an overview of hte historical development of these two sacraments as well as discuss the complementarity of these sacraments as it is articulated in The Catechism of the Catholic Church. There will be an examination of their current theological understanding along with attention given to the current rituals. Specific attention is given to the following topics: the sacramentality of marriage; the theology of the body; the relationship between marriage and celibacy; the relationship between ordained ministry and the lay apostolate; an understanding of hierarchy and the relationship between the three degrees of Holy Orders; the nature of the Eucharist as sacrifice and as foundational necessity in both sacraments. Several weeks back I learned that my home parish of All Saints in Quincy is to be closed within the next year or so. I sat down last week and wrote the following, reflecting back on the importance of this church in my life. From this church was cousin was buried. In this church I was sent forth to study and be formed for the priesthood of Jesus Christ. In this church I celebrated my first Mass of Thanksgiving. In this church is all I have and all I have known. The novel Christian reality is this: Christ’s Resurrection enables man genuinely to rejoice. All history until Christ has been a fruitless search for this joy. That is why the Christian liturgy – Eucharist – is, of its essence, the Feast of the Resurrection, Mysterium Paschale. As such it bears within it the mystery of the Cross, which is the inner presupposition of the Resurrection. To speak of the Eucharist as the community meal is to cheapen it, for its price was the death of Christ. And as for the joy it heralds, it presupposes that we have entered into this mystery of death. Eucharist is ordered to eschatology, and hence it is at the heart of the theology of the Cross. This is why the Church holds fast to the sacrificial character of the Mass; she does so lest we fail to realize the magnitude of what is involved and thus miss both the real depth of what it means to be human and the real depth of God’s liberating power. The freedom with which we are concerned in the Christian feast – the feast of the Eucharist – is not the freedom to devise new texts but the liberation of the world and ourselves from death. Only this can make us free, enabling us to accept truth and to love one another in truth (65). [Saints Francis and Clare of Assisi] understood that friendship with God is a mutuality of desires: God’s desire for us and our desire for God. That is why the cross is the sign of friendship because here is the visible sign of God’s unconditional love for us or, we might say, the pledge of God’s friendship with us. But if we really desire friendship with God we must ask, what kind of God do we desire to be friends with? If somehow we find our answer apart from the cross, we will always be seeking the ideals of joy and happiness in the wrong places. Francis and Clare assure us that the happiness of friendship with God is found in the strange relationship of suffering and love. If we are willing to love by way of suffering we will be on our way to friendship with God. Yes, friendship with God may be strange but then again this is no ordinary God. Rather this is a God who is reckless in love, and the one who desires friendship with God must become reckless in love as well – loving unto death. People who are reckless usually wind up in trouble because they do crazy things. Imagine being reckless for the kingdom of God. Just think what might happen. Friends of God loving one another the earth. Heaven breaking open in our midst (p. 103). By no means do I have a reckless personality; I have never had such a personality, nor do I expect that I ever shall. I have always preferred the cautious and calm manner for myself, all the while admiring those who seem a bit more reckless and spontaneous. Despite this, it is a beautiful dream to ponder - being absolutely reckless with the love of God, so reckless as to care not at all of the reactions of others, reckless enough to desire nothing more than the love of God, reckless enough to share this love with the world. Lord, make me this reckless! Who is God? This is the central question that the Church asks and celebrates today on this, the Solemnity of the Most Holy Trinity. Who is God? This is the very question Moses asked when he encountered the Lord in the burning bush. After receiving his mission to lead the Israelites out of slavery in Egypt, Moses asked, “But when I go to the Israelites and say to them, ‘The God of your fathers has sent me to you,’ if they ask me, ‘What is his name?’ what am I to tell them?” (Exodus 3:13). In other words, “Who are you?” This is the same question Saul asks of Jesus before he follows him and spreads his Gospel as the great Apostle, Paul: “Who are you, sir?” (Acts 9:5). Do we not each ask this question of God: “Who are you?” Moses is given this answer: “I am who am” (Exodus 3:14). Saul is given this answer: “I am Jesus whom you are persecuting (Acts 9:5). At the moment these two answers were given they were not especially helpful and certainly did not really clarify the strangeness of the two situations. Indeed, concerning the answer given to Moses, Pope Benedict remarks that the answer, “I am who am,” “seems much more like a refusal to give a name than the announcement of a name” (Introduction to Christianity, 86). And so it is with us. Many years ago I asked this very same question, “Who is God?" I did not ask this question in so many words, but the very pain of my being cried out to the Lord with this question. After the death of my father, I, as an eight year-old boy whose world had been torn asunder, cried out to the Lord in great pain and agony demanded an answer as to why my father had suddenly died. Two years later, I again cried out to him in pain and agony this time demanding an answer to my mother's death. I never did receive an answer as to why my parents died - nor do I think I ever really expected one - but I did learn something very profound through this pivotal experience. The more that I questioned, the more that I demanded an answer, the more that I wept and yelled, the more I came to realize the presence of God around me. It is, really, an indescribable sensation and realization to know that God is with you. All that I can say is that I felt very much at peace even though the two people whom I love most in the entire world are no longer with me. The more that I questioned God’s reasons and purposes, the more I asked, “Who are you?" perhaps without even knowing it. But I did not realize at the time that in feeling the Lord say to me, “I love you,” he was revealing to me the very essence of who he is. We know, first and foremost that “God is love” (I John 4:16). We know, too, as the Holy Father teaches us, “Love is always ‘mysterium’ – more than one can reckon or grasp by subsequent reckoning. Love itself – the uncreated, eternal God – must therefore be in the highest degree a mystery – ‘the’ mysterium itself” (Introduction to Christianity, 114). So then, God is love and love is a mystery, therefore God is a mystery. But then is this all that we can say about God? Is this all that he has said to us? Of course not. With the love of God as our starting point, we realize – as Pope Benedict reminds us in his Encyclical Letter - that God alone has created all things, he alone has created each of us, “consequently, his creation is dear to him, for it was willed by him and ‘made’ by him” (Deus caritas est, 9). We learn also that “this God loves man” (Deus caritas est, 9). In Jesus Christ, we realize also that “God’s passionate love for his people – for humanity – is at the same time a forgiving love. It is so great that it turns God against himself, his love against his justice” (Deus caritas est, 10). One could, in fact, say that God is a relationship of love. It is precisely because God is love that God is a relationship of persons: Father, Son, and Holy Spirit. One could see the Father as the Lover, the Son as the Beloved, and the Holy Spirit as the Love shared between the Father and the Son. In this way God is a communion of love, three persons all in one: the Blessed Trinity. It is because God is a communion of love that he calls each of us to receive his love and to share his love. In short, he and invites each of us to be in a relationship of love with him. Such is the beauty and the wonder of the power of love. This is, admittedly, still a difficult concept for our minds to grasp. We ask, how can there be one God, and yet three persons in the Godhead? 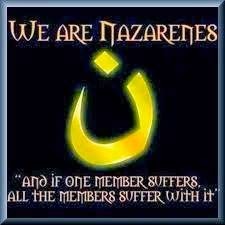 All I can tell you is that from my faith and from my experience I know this to be true. I cannot explain much better than this. Many of the saints have tried and this, it seems to me, is the best explanation that we have. We must be satisfied, then, to keep this mystery - this mystery of great and divine love - before us always. Let us desire nothing else, let us want nothing else, let nothing else please us and cause us delight except our Creator, Redeemer, and Savior, the only true God, let nothing hinder us, nothing separate us, nothing come between us (Earlier Rule 10). 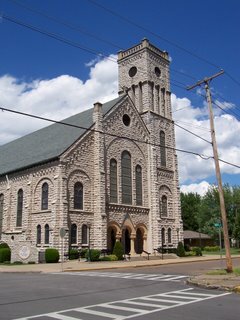 Having returned on Friday from a brief holiday respite in Lansing, Michigan, today I will my brother priests of the Diocese of Springfield in Illinois will be on retreat with our Bishop, the Most Reverend George J. Lucas, through Friday afternoon in Belleville, Illinois. Please keep us in your prayers, even as we assure you of our prayers, that we may grow in greater unity as a Presbyterate and that we might be given the grace of the Holy Spirit that gives refreshment and zeal in our ministry. In the beginning, “the earth was a formless void, there was darkness over the deep, and God’s spirit hovered over the water” (Genesis 1:1 [Jerusalem]). We see here the presence of the Holy Spirit at the dawn of the world and we see also the Holy Spirit present at the creation of mankind: “the LORD God formed man out of the clay of the ground and blew into his nostrils the breath of life, and so man became a living being” (Genesis 2:7). The breath of the Spirit creates and gives life. because it was by tongues (namely those of the serpent, Eve and Adam) that death entered into the world [cf. Wisdom 2:24]. The tongue of the serpent was poison to Eve, the tongue of Eve poisoned Adam, and Adam’s tongue tried to turn the blame back on God. The tongue is a cold organ, surrounded by moisture; thus: “It is an unquiet evil, full of deadly poison [James 3:8],” than which there is nothing colder. Therefore the Holy Spirit appeared in tongues of fire, to apply tongues to tongues, fire to deadly poison (Sermons, Pentecost, 3). With his forked and deceitful tongue, the serpent spoke a great lie to Eve and tricked her into believing that God did not want – nor even know – what was best for her, what would lead her to happiness, fulfillment, and peace. Through her conniving, Eve convinced Adam that it was safe to eat the fruit of the tree of which they were forbidden to eat. Through his pride, Adam refused to accept responsibility for his action, blaming first Eve for having tricked him and in the end blaming God, presumably for having placed the tree in the garden in the first place. O my people, I will open your graves and have you rise from them, and bring you back to the land of Israel. O my people! I will put my spirit in you that you may live, and I will settle you upon your land; thus you shall know that I am the LORD. I have promised, and I will do it, says the LORD (Ezekiel 37:12-14). Through the power of the Holy Spirit God the Father raised the Lord Jesus Christ from death and restored him to life. As the Crucified and Risen Savior breathed the Holy Spirit upon the Apostles he breathed into them his very life, and so Jesus breathes this same Spirit into and upon us so that we, too, might live. As Jesus breathed the Holy Spirit anew in this fashion what was done through the breath and tongue of the serpent, of Eve and of Adam has been undone; all has been restored and renewed. Through the outpouring of the Holy Spirit we are made new creations in Christ the Lord. Note that fire has four natures: it burns, it cleanses, it warms, it gives light. Similarly the Holy Spirit burns away sins, cleanses hearts, shakes off sloth, and enlightens ignorance (Saint Anthony of Padua, Sermon, Pentecost, 3). It is first of all, then, the fire of the Holy Spirit that we received at Baptism that burns away the poison of sin and death. It is the fire of the Holy Spirit who convicts us of our sins and leads us to confess them by waking us from our slumber and laziness and filling us with the light of Truth. In this way, and only in this way, we are re-created. We must be open to the movement of the Holy Spirit within us. We cannot stifle his work. We must yield to him and so come to a profound understanding of the love that Christ the Lord showers upon us sinners. The Holy Spirit, “sharing with each as he will” [cf. I Corinthians 12:11], breathes his grace where, how, how much, when and on whom he will. May he deign to breathe it on us, he who this day breathed his grace on the Apostles in tongues of fire. To him be always praise and glory, through everlasting ages. Amen” (Saint Anthony of Padua, Sermon, Pentecost, 3).